IMP C P LIC GALLIENVS P F AVG, Laureate cuirassed bust right | FELICITAS AVGG, Felicitas standing left, holding long caduceus in right hand and cornucopia in left. S_C across fields. I've liked Sestertii since I began collecting: they're big with room for plenty of detail and a design that's not crowded. AVT K ΠO ΛI O[VAΛEPIANOC], Laureate draped bust right | EΦECIAN Γ N_E_[ΩKOP]ΩN, Artemis standing facing, head right, quiver at her shoulder, long torch in both hands, stag at feet right. In looking through the British Museum Collection volume for Ionia, I see two distinct hands cutting the legends during this time. One makes his C and E characters very rounded, very Greek. He consistantly misspells NEΩKOPΩN NEOKOPΩN. The other engraver uses square Cs and Es, a rather Roman look. He spells NEΩKOPΩN correctly. I haven't quite settled on which one transliterates Valerian's name as OVAΛEPIANOC and which one as BAΛEPIANOC. A number of coins exist with one die from one hand and the other from the other, so they presumably were working at the same time. A small thing, and not very important, but I flatter myself to think that I know it and nobody else does. Until I hit POST, of course. SALONINA AVG, Diademed draped bust right on crescent | SALVS AVG, Salus standing right, holding snake in arms, feeding it from patera right. As was Aesculapius on Monday's post, Salus is a personification of health and well-being. 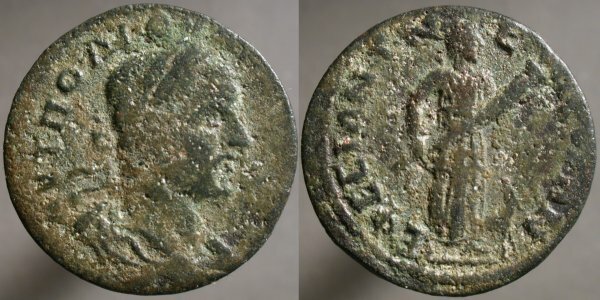 IMP C C VAL DIOCLETIANVS P F AVG, Radiate draped cuirassed bust right | CONCORDIA MILITVM, Jupiter standing left presenting Victory to Diocletian standing right. H in field, XXI in exergue. 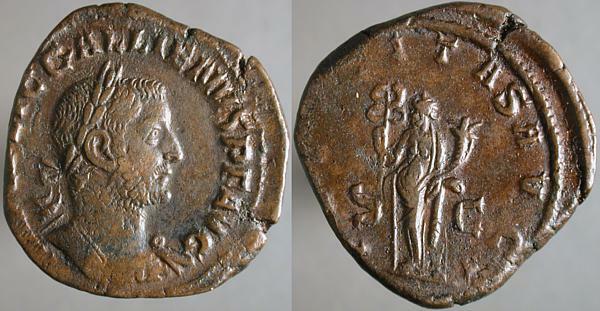 Following the deaths of Carus, Carinus, and Numerian, Gaius Aurelius Valerius Diocletianus became sole emperor, and presided over a time of great change. He instituted a tetrarchy in which two senior emperors ruled as Augusti, supported by two junior emperors, or caesarae, who were next in line to rule, at which time a new caesar would be appointed. The system was meant to eliminate instability during the succession, but required a degree of selfless dedication that exceeded what the men of power were willing to live up to without Diocletian's strong authoritarian hand. He promulgated price controls on staples which, predictably, made the staples unavailable at any price. His reorganization of the legions was more successful. 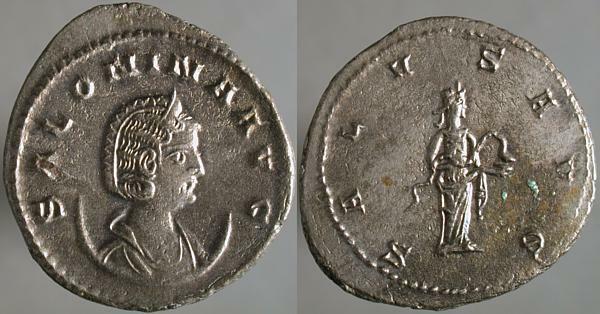 While this coin, minted early in Diocletian's reign, begins the obverse legend with IMP C (imperator caesar), the coins soon displayed D N (dominus noster) and signalled the end of the Principate, a last vestige of ideals of the emperor as the first among equals, and the beginning of the Dominate, with its notion of the emperor as the godlike master of all. In 305, Diocletian, in poor health, retired along with his co-emperor Maximianus, to be succeeded by the caesars, Constantius Chlorus and Galerius. By 308 the tetrarchy system was in such disorder that that he was called out of retirement to a council at Carnuntum, but refused to take up the purple again and continued in retirement until his death in 316. KOPNHΛIA CAΛΩNINA CE, Diademed draped bust right, on crescent, I before | ΠEP_ΓAI_ΩN, Chest with three purses. While cities vied for prestige and privilege, as part of the empire there was no possibility of military conflict between them, so activities like contests of sport or art substituted. 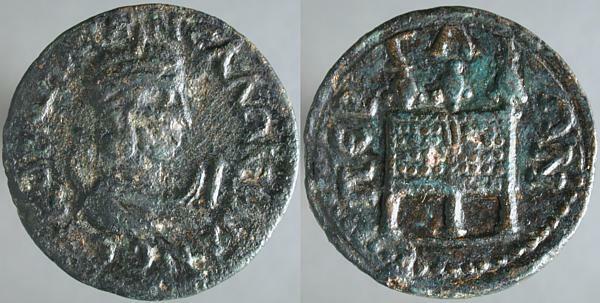 Perga issued many coins like this, displaying the prizes for the winners of such contests. GALLIENVS AVG, Radiate cuirassed bust right | CONSERVATOR AVG, Aesculapius standing left holding a rod around which a serpent is entwined, VIIC· in exergue. I don't know if this was issued to honor Aesculapius for the Emperor's recuperation from some illness, or for preventing any such illness from occurring. 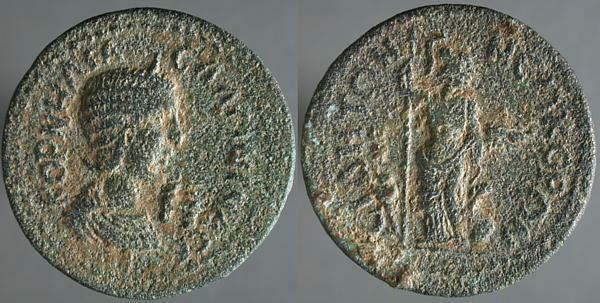 A Legionary Denarius of Septimius Severus at The Shekel. KOPNHΛIA CAΛΩNINA CE, Diademed draped bust right, H before | CIΔHTΩN NEΩKOPΩN, Athena standing right, holding spear in her right hand, at her feet, right, shield and palm branch, pomegranate in left field. What drew me to this, I think, was the large size, the attractive design (as procincials go) and it being a part of the competition between Side and Perga, two cities of Pamphylia that vied for superiority.